A Better Realty.Net BlogReal estate blogging from the inside! Mesa home for sale, this 3 bedroom split floor plan has tons of storage, 2 double garages, RV gate, a huge lot on a cul-de-sac, features mature desert landscaping. All this and this home borders ADOT land on the West, you will never have neighbors. Mesa home for sale, this 3 bedroom home features a huge great room, or you could have a family room and living room, formal dining room with storage, there is a deep linen closet for seasonal table clothes and dishes, and a closet for extra storage. The dining room has a wonderful view of the front yard. In the kitchen you will find a large pantry, Kitchen island with a sink and dishwasher, large prep area. This kitchen has an electric stove, you will not see the usual kitchen cabinets, cabinets and shelves are behind the bi-fold doors, Lighted and with plug-ins, toaster, coffee pot all hidden in seconds when the unexpected guests arrive. There is tile on the floor and a great bay window that looks out to the park like backyard. Mesa home for sale has an inside laundry room with storage, also a door to the backyard with a security screen door on it, it leads to covered patio. There is another door out to the 2 car garage, this garage is extended and also includes an office or shop, and there is an exterior door with a security screen door on it. Out in the back yard you will find grassy area for the family pet, additional storage. This yard is completely fenced, with mountain views. Mesa home for sale has an upstairs Master bedroom, this bedroom is large enough for a sitting room also, there is a glass slider that goes out to a balcony, and what views you will find, on these wonderful evenings leave the door open, yes, it has a security screen door. For applications go to www.abetterrealty.net scroll to the bottom of the page click on homes for rent, any application on the page will work. If you would like to pay on line use the paypal on the application page. San Tan Valley home for Rent! This home is IS AVAILABLE ! Welcome home to this San Tan Valley Rental, this 4 bedroom two story home has everything you can think of! Tile in the entry, wonderful living room with ceiling up to the 2nd story, windows have shade screens to help with that electric bill. Staircase is open to give that airy feel. 3 bedrooms with a loft are upstairs, and there is a balcony with mountain views off to the front. The Master bedroom and bath are separated from the other two bedrooms, the master has a private balcony with a glass slider, there are clear story windows in the master and master walk-in closet. The bath has a garden tub and separate shower, double sinks with taller vanity. This is a must see! Down stairs, you have a formal living room, family room with glass slider out to a covered patio, entertainment center and are open to the kitchen and eating area. There is a bay window in the eating area, and a breakfast bar! You are not going to believe these kitchen cabinets! Over sized and gorgeous, a walk-in pantry. There is a formal dining room, full bath room and laundry room with sink and cabinets! Out to the 2 car garage you go. This home has so many pluses that it you just must see it!!!! Call for your appointment 480-655-0904, you don’t want to miss this fantastic value of a home. Queen Creek School District; San Tan Heights Elementary School, San Tan Heights Junior High, Posten Butte High School. we can email applications also, you can pay for your application on the website through Paypal! 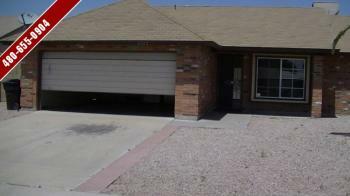 This 3 bedroom 2 bath is in Desert Sands Golf and Country Club Subdivision there is NO H.O.A. You are close to Banner Gateway Medical Center, I-60 and the 202 freeway Homes for rent Mesa AZ there is Superstition Springs Mall, Home Depot, all types of entertainment and restaurants. Homes for rent Mesa AZ the school district is Mesa Unified Schools, Skyline is the High School, and Brimhall is the Jr. High, Jefferson is the Elementary School. This 1849 square feet is used very well, large kitchen with cabinets a plenty, kitchen Island for extra prep area. The laundry room has a sink and counter space with cabinets. The kitchen flows into the formal dining room with built in hutch. Arches for nice detail with plant shelves above also cute windows in the dining area. Homes for rent Mesa AZ large living room/great room, with coat closet. The Master features a walk-in closet and full bath with double sinks, large soaking tub, and separate shower, and linen closet. For an Application to this home go to www.abetterrealty.net homes for rent any of the applications will work. We do take the family pet, there is an additional fee for your buddy. Great Monday! Working on getting another short sale accepted. 5 bedroom home in Queen Creek Arizona this home features over 3,040 Square feet, it is a 2 story and has 3 full baths, one bath is on the main level of the home. This 5 bedroom home in Queen Creek Arizona is in a great community with a country feel. However this house is not your country home, attention to detail has been crafted in this home. One full bath and bedroom on the main level of the home, living room with formal dining room, and a kitchen that has room to cook, and room for a full size table, with a tile floor. Island in the kitchen for prep work and of course a dishwasher! Pantry for storage, and a breakfast bar windows to let the sunshine in around the table. You will be able to see yourself in this kitchen. Great family room for entertaining or just relaxing watching a movie. Upstairs you are going to find an ample master bedroom with walk-in closet and wonderful master bath, separate tub and shower. 3 other bedrooms up stairs all are nice size rooms. They all share the hall bath. This home is a short sale and will not be on the market long, this is a great home. This 5 bedroom home in Queen Creek Arizona is in Maricopa County and near the 202, There are plenty of shops, restaurants, outside entertainment. This 5 bedroom home in Queen Creek Arizona is in Emperor Estates with Queen Creek Unified School District, Desert Mountain Elementary School, Frances Brandon-Pickett or Jack Barnes Elementary school, Newell Barney Junior High School or Queen Creek Middle School, Queen Creek High School, check them out athttp://www.qcusd.org/ . Get help with your loan mod, short sale …. STOP foreclosure. Fantastic Weather for Open House, and Yard Sale! Come by and see us, great weather to be out Shopping! Wonderful house for Sale, Huge 5 bedroom! Saturday May 26, 2012 6:00 am – 10:00 am yes we are trying to beat the heat! 5 bedroom home in Queen Creek Arizona this home features over 3,040.00 Square feet, it is a 2 story and has 3 full baths, one bath is on the main level of the home. This 5 bedroom home in Queen Creek Arizona is in a great community with a country feel. However this house isn’t your country home, attention to detail has been crafted in this home. One full bath and bedroom on the main level of the home, living room with formal dining room, and a kitchen that has room to cook, and room for a full size table, with a tile floor. Island in the kitchen for prep work and of course a dishwasher! Pantry for storage, and a breakfast bar… windows to let the sunshine in around the table. You will be able to see yourself in this kitchen. Great family room for entertaining or just relaxing watching a movie. Upstairs you are going to find an ample master bedroom with walk-in closet and wonderful master bath, separate tub and shower. 3 other bedrooms up stairs all are nice size rooms….. They all share the hall bath, there is room. This home is a short sale and will not be on the market long, this is a great home. This 5 bedroom home in Queen Creek Arizona is in Maricopa County and near the 202, There are plenty of shops, restaurants, outside entertainment. This 5 bedroom home in Queen Creek Arizona is in Emperor Estates with Queen Creek Unified School District, Desert Mountain Elementary School, Frances Brandon-Pickett or Jack Barnes Elementary school, Newell Barney Junior High School or Queen Creek Middle School, Queen Creek High School, check them out at http://www.qcusd.org/ . This Town home will be open on Sunday April 29, 2012 from 1:00 pm – 3:00 pm, if you are looking for a wonderful home to rent, come check it out. for directions Call Bill 602-390-3096.
for more information go to www.abetterrealty.net under homes for rent. LisaHanawalt: I am looking for a house sitter... short sale in Mesa contact me to find out how! LisaHanawalt: Real Estate is never a dull job. Had a call from a tenant, snake in the back yard. Couldn't find it, yes! we looked. Dean411 on Thank you Dean411 ! bucknell university on A Cleaning Person that Cleans!!! !